Apple Music tracks are 256kbps AAC files | What Hi-Fi? There's been much speculation about the quality of the Apple Music streams but no confirmation from Apple – we have now at least found a grain of information within the new-look iTunes. We knew that Apple wasn't about to spring a surprise and offer CD-quality, lossless streams to match Tidal and Qobuz, so the smart money has always been on Apple Music offering 256kbps AAC streams. Why? AAC is Apple's format of choice and 256kbps is what you'll get when you buy an iTunes download or use the iTunes Match service to upload your library to Apple iCloud. There's no hint of confirmation from Apple on this, be it online or in the new Music app, which launched as part of iOS 8.4. There is however some information in the latest version of iTunes, which was released a few hours after the Apple Music launch. Head to the My Music tab, right-click on the track and then select Get Info to see the file information. 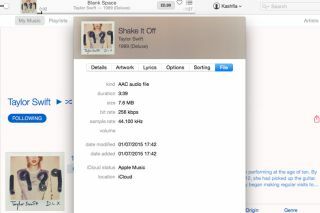 The File tab on the far right shows that Taylor Swift's Shake It Off is a 256kbps AAC file. As noted, this is the file stored by Apple Music in iCloud (see above). By contrast, a WAV file stored locally on the Mac in question is shown as such, complete with higher bitrate and the different location (see below).